Winter is seems to be a pleasant time for hot country like India. Winter fashion in India is different from those western cold countries as well. In this cold season people cover their body with warm clothes & other wool accessories. But those days are gone when people used to wear woolen clothes just to warm their bodies. Today people wear fashionable winter clothes & other fashion accessories during this season. 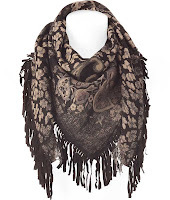 Most of people uses shawls, scarves, fashion ponchos & neck scarves or mufflers during this season of cold winds. While most of the girls & ladies are seen wearing a square wool scarf around their neck. Winter fashion Accessories like square scarf are used around the wold as winter accessories as well as a fashion accessory these days. Wool square scarf has double qualities; elegance and comfort. Popularly known as jamawar in India, these are hand-woven scarves in wool of very high quality, keeping your body warm, yet never giving that itch feeling that we commonly experience with woolen clothes. Jacquard weaving in jamawar is very classic, something that was initially popularized by the French in 17th and 18th century, when they started to have shawls made in India according to their designs. Wear these long rectangular scarves to your office as a regular business or formal wear. They have subdued elegance. Others will silently admire your taste. In jamawar square scarf, the design is woven into the very fabric of the cloth. This is done by replacing the shuttle used in ordinary weaving and a series of small, eyeless wooden bobbins known in Kashmiri as Kani, each filled with colored yarn. The work is achieved by two or three weavers seated on a loom. 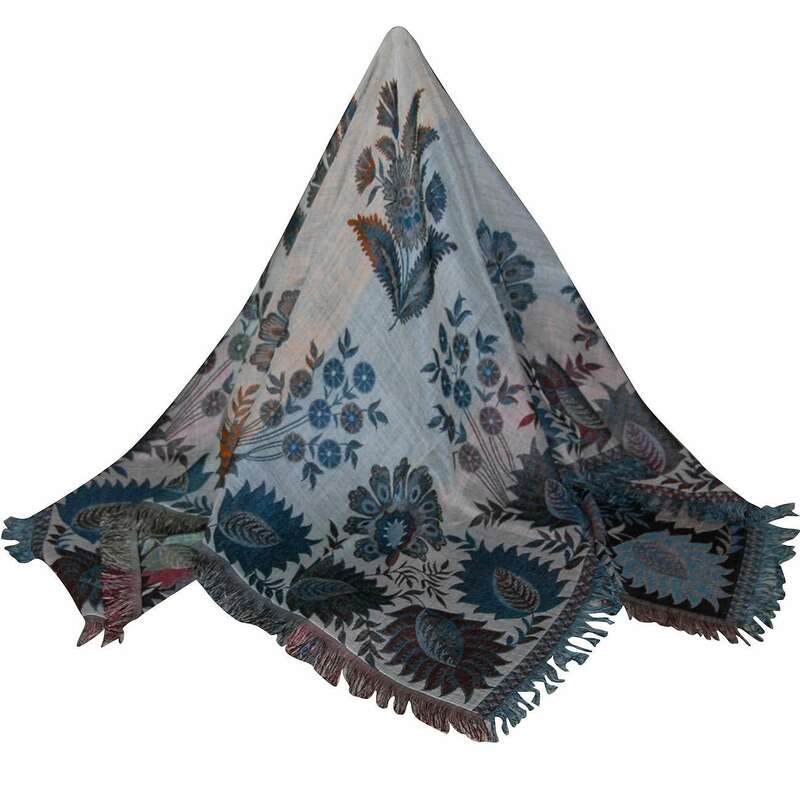 The jacquard designs used by scarf manufacturers in Europe had profound influence on Kashmirs own Kani design. Thus the cone entered the final phase of development as an abstraction, a scroll, often less a unit on its own than part of an overall complexity of pattern. 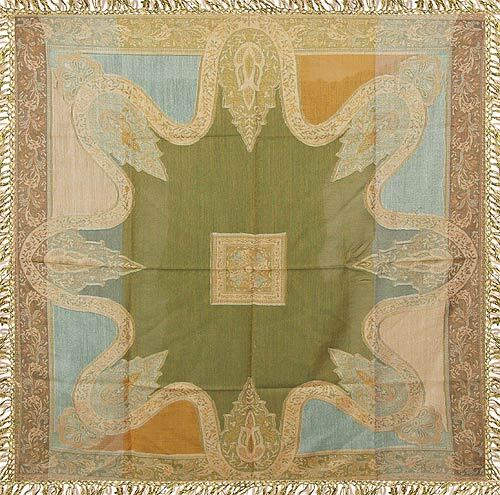 The marriage of jacquard designs and kani technique was often not aesthetically successful, and in the scarf of the industry's great period, the exuberance of the Sikh period design often degenerated into coarseness, even vulgarity. This general decline of artistic standards, however, did not preclude the production of particular exquisite pieces, and certainly implied no lowering of the standard of an infinitely painstaking craftsmanship. Fashion Tips - How to Tie a Scarf ? Eternally fashionable, scarves are the most versatile accessory for women. The available variety of fabrics, shapes and sizes make the scarf ideal for all seasons and occasions. These scarves offer the perfect way to add a touch of elegance and charm to your attire – formal or informal. 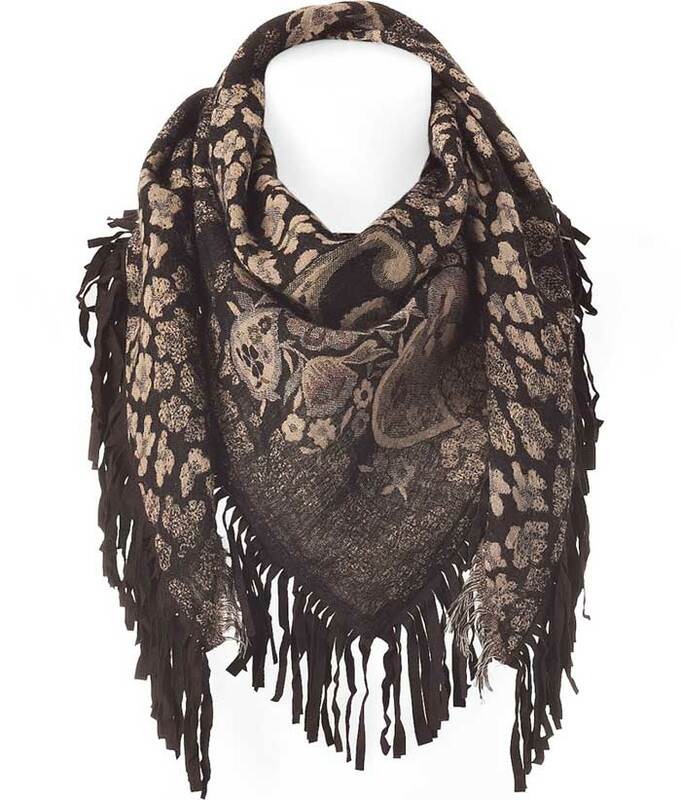 A scarf tied with aplomb adds style and warmth to your winter wardrobe. A scarf, in its basic sense, works because it surrounds and protects your neck and keeps cold drafts of air from spiraling down your collar, leaving you susceptible to catching a chill. 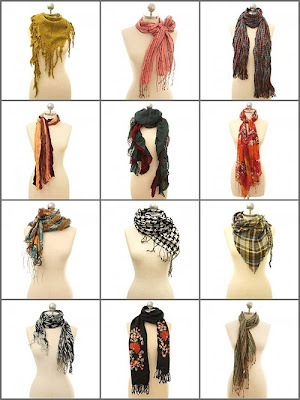 Here are some popular ways to wear shawls and scarves. People also wear them over the head, around the waist, to carry babies, and in many other creative and unique ways. Fashion jewelry like gemstone necklace is made from naturally occurring crystalline form of a mineral, which is desirable for its beauty, valuable in its rarity and durable enough to be enjoyed for generations. 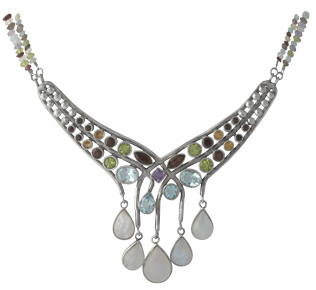 There are more than 30 popular gems varieties and many rare collector gemstones. 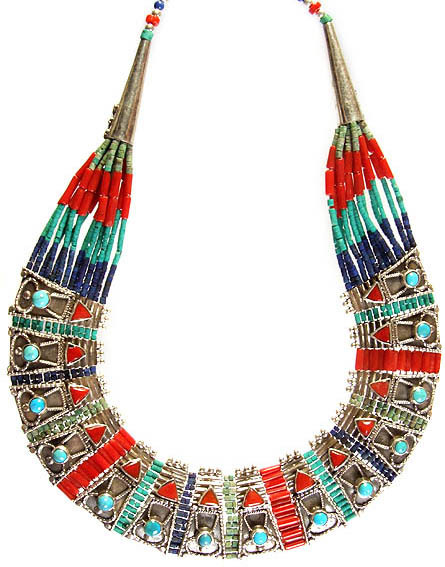 Intricately designed necklaces and jewelry sets in a rich profusion of colors, to match any apparel and any occasion flawlessly finished beads set in elaborate designs to enhance the feminine beauty. Gemstones are considered the repositories of cosmic rays and in India they are used to treat illness, enhance one’s fortunes and ward off evil effects. They are believed to restore the equilibrium in the human beings. Silver or Gold gemstone necklaces in a whirl of colors are attractive bargains, which can be worn on all occasions they could, depending on the astrological configuration you were born, also contribute to happy and healthy living. Choose from the many splendid stone, which have timeless fascination and possess deep powers of healing. Handmade paper mache gift boxes make ideal presents for any occasion. Quality workmanship of Kashmiri craftsmen can be seen in the richly textured paintings. The designs used in paper mache naqashi are very intricate and their application requires a great deal of skill and accuracy. 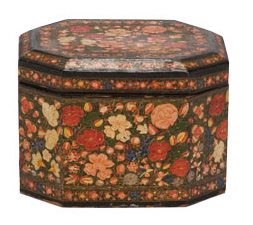 The patterns are painted free hand. The naqash draws from the reservoir of patterns and motifs in his memory. 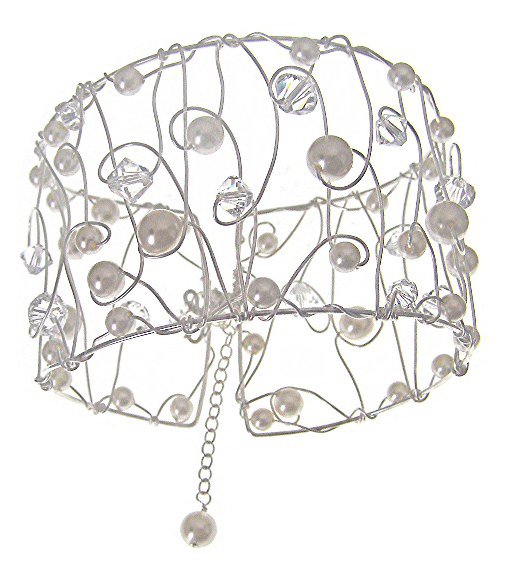 The chosen design is first outlined in a light color and the spaces outlining flower or the other forms which are to be filled with color are initially painted white. After this, flower, birds and other motifs are painted. 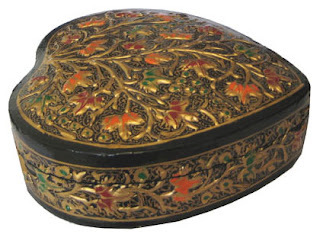 Paper Mache products for gifts and decoration, handmade by craftsmen of Kashmir in India. Order these beautiful and unique Christmas decorations in bulk, in time for the holiday season. The creation of a papier-mache object can be divided into two distinct categories, the Sakhtsazi (making the object) and the Naqashi (painting the surface). The form is molded using a base shape. This form is made of the pulp of paper, cloth, rice straw and copper sulphate pulp. The form is then coated with gypsum and glue, followed by thin tissue paper. On drying they are rubbed, smoothened and burnished. The form is then given the base color. The colors for painting designs on the surface are obtained by grinding and soaking various vegetable mineral dyes in pigment or stone form. The object is then sandpapered and burnished, and finally painted with several coats of a varnish made of linseed oil and pine resin. Papier mache, has become a sophisticated art, with even more attractive results, by using real gold and silver paint and intricate decorations. The final product is a beautiful art work that cannot be called a creation of one artist. It travels many pairs of talented hands before reaching a table or a mantel. 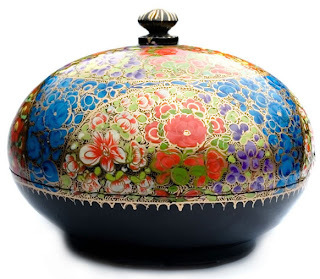 The Mughals and the Europeans were the great admirers of this craft. 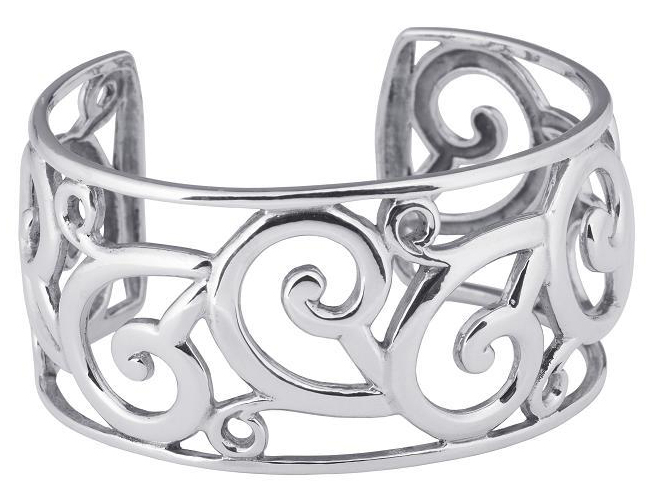 Bracelets have great romantic and amorous connotation. A simple bracelet is slipped on to the wrist by mere pressure, occasionally over a thin coating of oil applied to the hand. Some bracelets have a gap between the two ends from where these are slipped on to the wrist from its side. 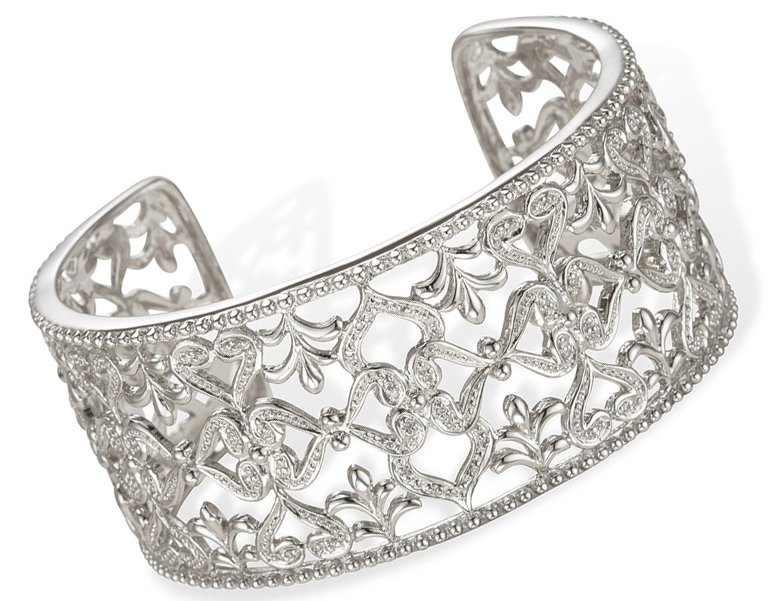 In most cases, the single tier bracelet, when hollow, is adorned with repousse work motifs, and when solid, with engraving. 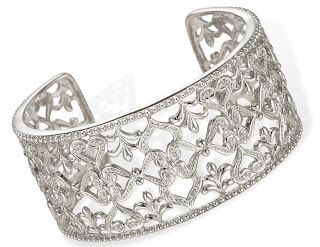 In two tiered bracelets, the outer rim is usually adorned with additional lobes, pendants, and jingle bells. 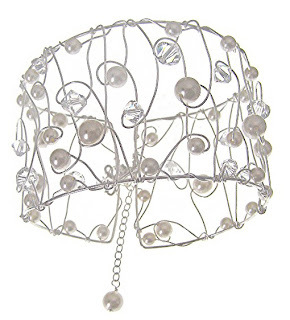 The more handsome variety usually comprise of a prominent pendant attached to a circular ring which in turn may have further smaller pendants or other decorative elements affixed to the outer rim. 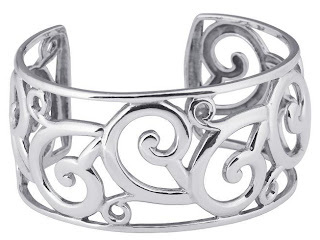 Often the screw of the pin that locks the bracelet is itself a highly decorative element, not distinguishable as a separate part, but an integral component of the design. Copyright © 2015 Apjav. Simple theme. Theme images by merrymoonmary. Powered by Blogger.